I got behind the blog writing when Laura and Gage where here. Catching up is hard to do. This blog may be a bit longer but it catches up. 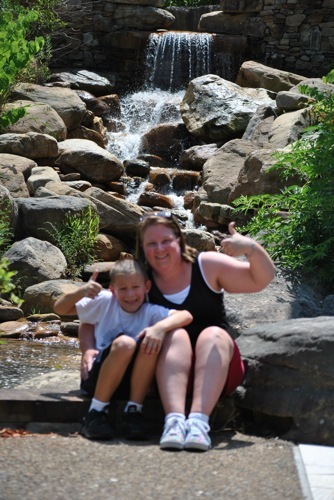 Sunday, 7/8 Laura, Gage and I took a drive to the Ocooe Whitewater Center in Tennessee about 20 miles west of here. 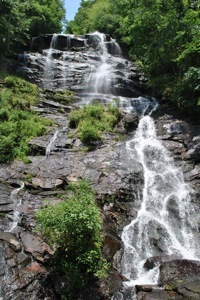 The Toccoa river in Georgia changes names to the Ocooe River in Tennessee. If you recall, we had a picnic supper by the Toccoa River and enjoyed a Blue Grass Jam when Laura and Gage first arrived. The Tennessee Valley Authority manages the water flow that gives the rafters their white water. This river sports class III and class IV rapids. This is where it all begins. The view from Boyd’s Gap presents a good perspective of the starting point about 3 miles up river from the Ocooe Whitewater Center. There is a forest service road that is used to deliver the rafters to their starting point. I’ve been told to be there before the TVA opens the valve from the dam. The sight of the river being filled with water from the dam has to be spectacular. If you look at the view from Google map http://goo.gl/maps/tiRJ you can see the dry river bed. 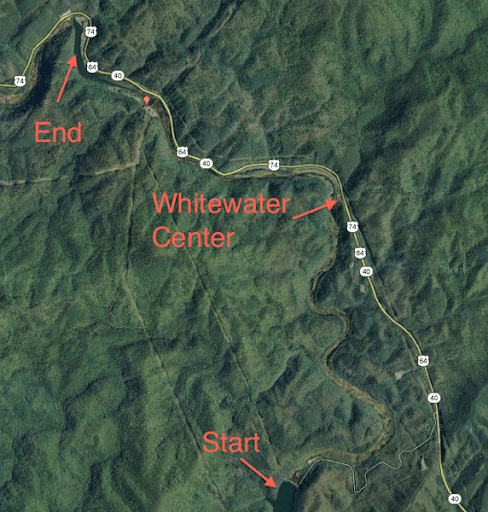 There is a dam at the start and end of the route. Many rafters continue past the second dam (End at the top of the photo) as they journey closer to Lake Ocooe another 5 miles away. After a day of watching the rafters conquer the river, Laura and Gage gave their sign of approval. Laura’s vacation was over. On Monday, 7/9, we drove to Atlanta where we dropped her off for her flight to Houston. From there she would drive back to Corpus Christi. 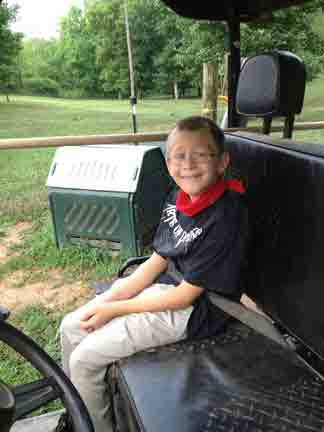 Our grandson, Gage would remain with us until Wednesday. 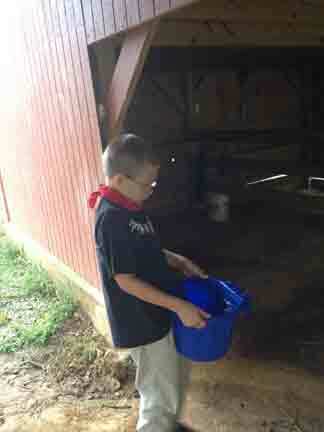 Tuesday, Gage worked with me tending the boys. He did a great job handling the chores. 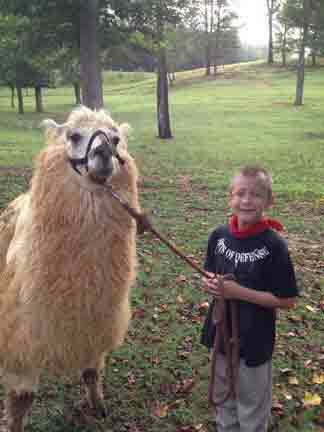 The llamas need fresh water. 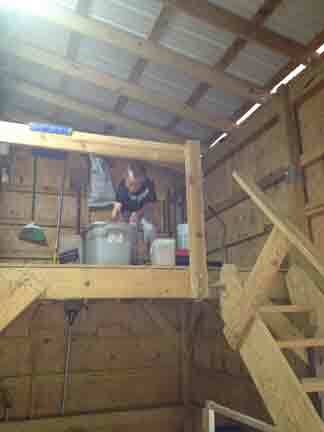 Then he prepped the feed buckets. 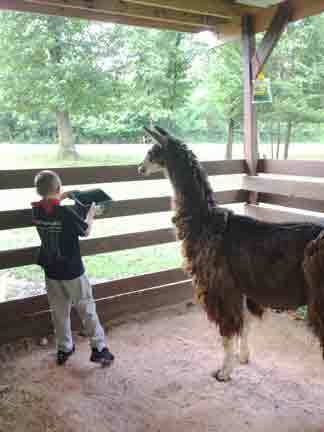 After the llamas eat, they are then walked. We do not want them to forget what walking on lead is about. First out of the barn is Major Deal. 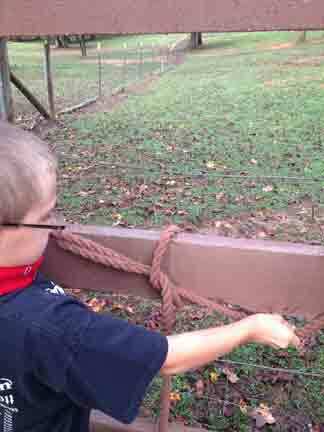 Gage learned how to tie the halters to the fence. 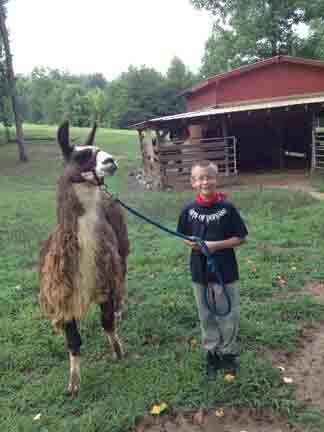 Then we drove chuck wagon to the llama poo dumping grounds. 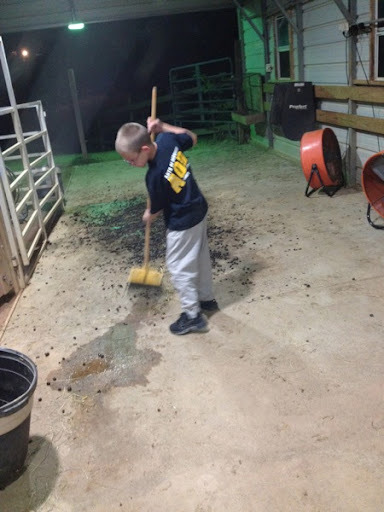 Then Tuesday evening, he help clean up the girls’ barn. Those girls sure do make a mess! It did not take him long to slip off to dream land. Wednesday, we drove one more time to Atlanta. Gage flew his first unaccompanied flight. He just took off like he knew what he was doing. Of course the gate attendant was leading him off. I can only imagine Gage telling his school mates what he did during summer vacation. So long Gage. It was a fun week. G’mee and I were sad to see him go. So there you have it. Next blog posting will tell the story of the missing purse and the broken fence post. Ya’ll come back now. Day 3 of Laura and Gage’s visit was Saturday. one more state park, swimming in a lake and another hike for water fall photos. We had a light breakfast because we were taking a picnic lunch to the park. Where you ask? Vogel State Park. This park is located just south of Blairsville, GA on US Highway 19/129 in the Chattahoochee National Forest at the base of Blood Mountain. Vogel State Park has lots of amenities: camp sites, cabins, swimming, hiking trails, and more. Gage had a wonderful time swimming in Lake Trahlyta. We even had a chance to share our RV lifestyle with a family there from Sarasota, Florida. After a picnic lunch, Laura and I took off for a close-up view of Trahlyta Falls. I can hardly call the hike a hike since it is pretty flat and level for about a mile. Then at the bottom of the lake, a short trail descends to the lower falls. Once at the bottom, the view is pretty cool. Trahlyta Falls drops 110 feet so while the distance is not spectacular, the waterfall is pretty cool. We encountered a rather large family group who showed very little respect for basic hiking rules (i.e., stay on the trail, don’t leave trash behind). We waited for this group to leave the platform at the base of the falls. A park ranger was bring different group down to the falls. She called out to the adults who were way off trail and even warned the adults to coral the small kids who where all over the place. As I side note, I am amazed when I see folks who have complete disregard for park rules. Even more amazing, is the behavior that could lead to a serious accident. Walking trails in flip-flops may be ‘cool’ but it is certainly not safe. The teenagers in the group that followed us to the platform thought it wold be cool if they all sat on the railing. One slip and a fun weekend could turn into a disaster. OK, I’ll get off my soap box. I experimented a little more with slow shutter photography. The idea is the get the water to look like cotton. When Laura and I returned, we packed up and headed to one final destination. We were very close to Brasstown Bald. This peak is the tallest spot in Georgia (4,784 feet). The short road up to the parking area is pretty steep with grades exceeding 12%. From the parking area, there is a hiking trail to the summit. This 1/2 mile trail goes up 500 feet. The trail is paved and there are places along the way to take breaks. Th easy way to the top is by shuttle from the parking lot. The heat provided a haze in the sky so the views were not very clear. I can only imagine what the trip up is like in the spring when the Rhododendron are in full bloom. I thought I could get Sunday’s activities in this post. That ain’t gonna happen. You will just have to come back tomorrow to see what we did Sunday. We were blessed with pretty good weather. It was a bit warm but the low humidity made the heat tolerable. A big Texas Howdy to Michelle from Michelle’s Big Dream. Welcome to WagginTailsRV. Hope our blog helps you reach your dream. There were stairs descending the middle section of the falls. I opted to not go down because what goes down must come up. 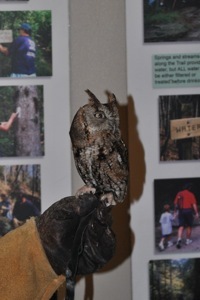 At the visitor’s center, one of the park staff brought at an Eastern Screech Owl. This owl was pretty small. He was probably bout 6-8 inches tall. If you get squeamish over photos of snakes, you want to stop here. On the way back from the falls, we saw this snake enjoying a late lunch. Since I am not a snake expert, I will not venture to guess what the snake is. There was a family walking behind me who had three dogs. I point out the snake to them because I did not want one of their dogs to investigate. Following that adventure, we decided to head back to Blue Ridge for dinner at Joe’s BBQ. Unfortunately we had to settle for a different BBQ place since Joe was closed for the week. After dinner, Carol and Gage headed to the movies to see Brave. Laura and I headed to the theater to see Greater Tuna. This play was absolutely hilarious. Two actors play 20 characters. We had a grand time. In fact I enjoyed it so much, I am taking Carol to see it at the end of this week. Tomorrow, I’ll tell you about more of their visit. Thanks for stopping by. As I begin this blog posting, I realized it has been eight days since my last post. Gee! Where does time go? Such a crazy question. Time moves on. Perhaps the better questions is, “Have I been so busy that I lost the since of time?” Regardless, it is a question which has no answer other than time moves on like water flowing down a river. While we were on our vacation a few weeks ago, Sadie and Savannah went to a new home. Then on Saturday, June 30, Indy, Arkie and Domino went to their new home in Tampa, Florida. We miss our new friends. On our evening cleaning chores, I would call Arkie to come for an evening snack. From the bottom of the pasture she would turn to look toward me when I called her name. Then she would scamper up to the barn for her snack. I hope she has as good a home in Tampa as she had here. Arkie and Domino are in the background. Indy is the Brown and White on the right. Ricky and Indy had Barn 1 pasture all to themselves. With Indy gone, we moved Cricket to Barn 1 pasture on Sunday 7/1 so Ricky would have a barn buddy. 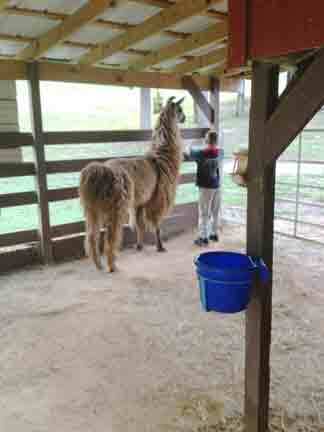 At some point, we will move Ricky and Cricket to the front pasture where the other boys hang out. On Wednesday 7/4 our daughter and grandson arrived for a short visit. We made trip to Atlanta’s Hartsfield–Jackson Airport. I was pretty impressed with the travel to the airport. The roads were well marked and the traffic was light. Of course it was a holiday so I did not encounter normal weekday traffic. The airport has a cell phone parking lot where folks can park for free while their arriving passengers make their way through baggage checkout. Just as we got Laura and Gage loaded in the truck, Atlanta weather got weird. A short thunderstorm dropped cold rain as I was getting their bags stowed in the back of the truck. I had the foresight to bring some large garbage bags with us so the luggage stayed dry as we traveled back to Blue Ridge. Our first stop was Pappasito’s Cantina in Marrietta, just a bit north of Atlanta. While we prefer to stay away from chain restaurants but a trip to Pappasisto’s was worth it. The Pappas’ family has a reputation of excellent food service and great food. While they are primarily located in Texas, they do have locations in other states. If you are ever near one of their restaurants, I highly recommend you stop by. You will not be disappointed. We got Laura and Gage tucked away for a rest Wednesday night. 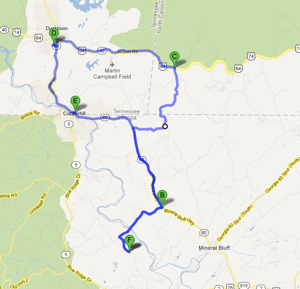 Thursday, we embarked on a whirlwind tour of the area. 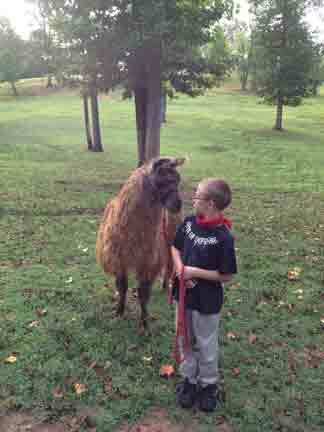 Laura and Gage are pictured here with Hen, one of the female llamas. Thursday afternoon/evening we took a scenic drive through Northern Georgia, Western North Carolina and Eastern Tennessee. That sounds like lots of miles but it was not. Blue Ridge is about 10 minutes south of the junction of North Carolina, Tennessee, and Georgia. Following the scenic drive, we stopped at Horseshoe Bend Park in McCaysville, GA for a picnic supper on the Toccoa River and a Blue Grass Jam. Just about the time we were grooving with the music, the wind picked up considerably. The WeatheBug app on my phone showed we were due for some rain in just a few minutes. We packed up and headed for a cool treat at DQ. Thursday came to an end too quickly. Laura and Gage enjoyed the day and are beginning to understand the joy we have found in the mountains. The next few postings will tell the rest of the story.